The SY88803V low power limiting post amplifier is designed for use in fiber-optic receivers. The device connects to typical transimpedance amplifiers (TIAs). The linear signal output from TIAs can contain significant amounts of noise and may vary in amplitude over time. The SY88803V quantizes these signals and outputs PECL level waveforms. 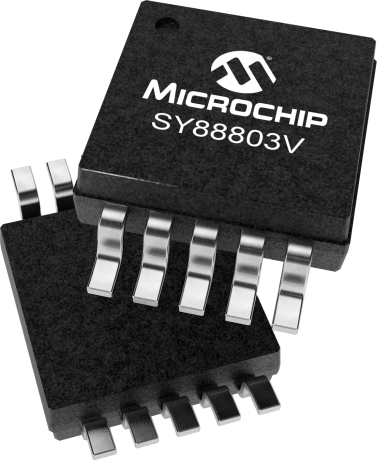 The SY88803V operates from a single +3.3V or +5V power supply, over temperatures ranging from -40°C to +85°C. With its wide bandwidth and high gain, signals with data rates up to 155Mbps and as small as 5mVp-p can be amplified to drive devices with PECL inputs. The SY88803V generates a TTL LOS output. A programmable loss-of-signal level set pin (LOSLVL) sets the sensitivity of the input amplitude detection. LOS asserts high if the input amplitude falls below the threshold set by LOSLVL and deasserts low otherwise. /EN deasserts the true output signal without removing the input signal. Typically 4.6dB loss-of-signal hysteresis is provided to prevent chattering.